Old Bay Biscuits are one of the top reasons that people go to Red Lobster. Am I right?! The only down side is that the restaurant ones seem to dry out super fast. Such a bummer. With this recipe, you’ll be able to whip up your own cheddar biscuits whenever you want! These biscuits are dense, buttery and cheesy, garlicky and they’re just as good hot from the oven, as they are at room temperature. And they’re so soft and moist you guys! Ugg, I want one right now! With loads of shrimp! But I digress. If you don’t plan on eating them within an hour of pulling them out of the oven, I recommend refrigerating any leftover biscuits in a covered container. These also freeze incredibly well. Just warm them up in the microwave on defrost for about 20-30 seconds. Preheat the oven to 450 degrees. Line a quarter sheet pan with parchment and spray with nonstick spray. Set aside. In the bowl of a food processor, combine the first 6 ingredients. Pulse to combine. Then add in the 1/2 cup of cold butter cubes into the dry ingredients and pulse until the butter is roughly the size of small peas. Pour the mixture into a large mixing bowl, and toss the shredded cheese with the flour mixture. Then pour in the buttermilk and heavy cream; stir just until combined. Use a 2 ounce scoop (or 1/4 cup), to scoop the biscuit dough onto the prepared pan. I was able to cram 12 of them onto the pan. They will spread as they bake, and I don’t mind them touching, because that keeps the edges from completely drying out. If that bothers you, use a larger pan or cookie sheet and space them out. Either way, bake them for about 10-12 minutes, or until light brown on top. In a small microwave-safe bowl, melt the salted butter and stir in the garlic and parsley. Set aside. When the biscuits are done, take the pan out of the oven and brush the tops of the biscuits with the melted butter mixture. Using as much, or as little, as you’d like. I always use the entire amount of melted butter on the biscuits! *Buy a block of cheese and shred it yourself – the bagged shredded cheese has a coating that prevents the cheese from melting well in your baked goods. If you are into gluten free baking, or if you’re just interested in a healthy-ish chocolate stuffed cookie – then these are for you! In all honesty, my favorite chocolate chips cookies are still these, but when I’m in a hurry or just craving a healthier version, these are my go to. Let me know if you try them! In a medium bowl, beat the butter with the sugars until fluffy. Beat in the salt, baking powder, and vanilla until combined. Beat in the egg. Set aside. In a food processor (I use my mini one for small jobs like this), add 1 1/4 cups of oats and the cornstarch, and grind until the oats are fine – about 30 seconds or so. Stir the ground oats, plus the remaining 1 cup of regular oats, into the batter. Add in the chocolate chips and the M&M’s – feel free to use more, or less, depending on your preference. Stir until combined. Using a 1 1/2 Tablespoon cookie dough scoop – scoop the cookie dough onto baking sheets lined with parchment. Bake for 15-16 minutes, or until the cookies have spread and are brown around the edges. I get 6 cookies onto an average sized baking sheet. Let cool and enjoy! These keep for about 4 days in a covered container at room temperature. My kids love Norwegian Pancakes so much that one batch is never enough! They’re like a crepe, but slightly thicker. We like to fill them with Nutella and top them with berries and powdered sugar, but they’re equally good with triple berry filling. Feel free to halve the recipe – the one listed below makes over 20. I like to make them on the weekend for busy weeks. I just cook them, stack them on top of each other on a plate, and cover them with plastic wrap once they’ve cooled a bit – then store them in the refrigerator. On school days, the kids just heat them on defrost in the microwave for about 10 seconds and swipe on a layer of Nutella or jam, roll them up, and eat breakfast! They don’t stay warm for long, but luckily, they’re equally tasty at room temperature! Heat a nonstick 10 1/2 inch skillet on medium high heat (5/6) on the stove. Let it continue to heat while you make the batter – the pan will need at least 5-8 minutes to heat up. In a high powered blender – blend all the ingredients until smooth. Scrape the sides, then blend again. When the skillet is ready, spray it with nonstick spray, then pour about 1/4 cup of pancake batter into the center of the pan – then using the pan’s handle, lift the pan off the burner and make a rotating wrist motion to spread the pancake batter along the entire bottom of the pan. Place the skillet back on the burner, and cook for 30 seconds to 1 minute per side. If your pan was not hot enough, the pancake may take significantly longer to cook. You can tell when the pancake is ready to flip because the edges will be light brown and lacey, and only the center will have wet batter in the middle. To flip – take a thin nylon scraper and gently loosen an edge under the pancake, insert a heat resistant turner underneath, and flip. I only have to use nonstick spray once per pancake! Repeat with remaining batter, being sure to spray the pan before starting a new pancake. Then there were some things that completely lacked a recipe at all – like her famous vinaigrette. If you had asked her, she probably would have told you that you just shake some olive oil, some vinegar, and then salt & pepper to taste. All the while, watching your greens become all wilted from the olive oil and vinegar while you try to figure out just how much salt and pepper you think you need. Honestly, that’s too much pressure! Who’s got time for that?! Definitely not me, so I’ve got you covered. Here’s the no-fail recipe, with bare minimum ingredients for the best vinaigrette. I like to use it as a dressing for cucumbers and onions (as seen above), or with any type of mixed greens. I know it sounds too simple to be delicious, but it truly is! Whisk together all the ingredients and store in a covered carafe in the refrigerator. Shake before using, always! Store in the refrigerator a good month. Just a note – the olive oil will eventually harden from cold storage in the refrigerator, just place the bottom of the carafe in a bowl of warm water and shake after about 5-10 minutes – just before using. Or simply run warm water over the bottom of the carafe until the olive oil becomes liquid again, and shake really well before using. Eek! I’m so super excited to tell you about these spices. In fact, truth be told, I’ve been holding out on you – for the last year. I know, I know, I just wanted to keep them all to myself, but they truly are so great that I must finally share them with you! This company is owned by a mother/daughter duo who grow their own herbs, and make the most amazing spice mixes – with fabulous names (Biking Through Burgundy, Love in a Tuscan Kitchen, Painted Desert, etc.). I actually visited their hometown of Rochester, MN and stumbled upon these yummy spices at my favorite cooking store – Cook’s Pantry (which I discovered has closed!). On Gardenaire’s website they have suggestions for how to use each of the spice mixes, and some recipes. But what the heck, buy one of each – you won’t be sorry! And while you’re at it, buy a few for your friends too. If spices aren’t your thing (what?!) -they also carry a line of shrub mixes, infused syrups, teas, marshmallows, and drinking chocolate. I think I’m going to add a few to my next shopping cart, and who knows, maybe something will actually make it to someone else as a gift, but I’m not making any promises! Let me know if you’ve tried any of their products and have a suggestion for me! 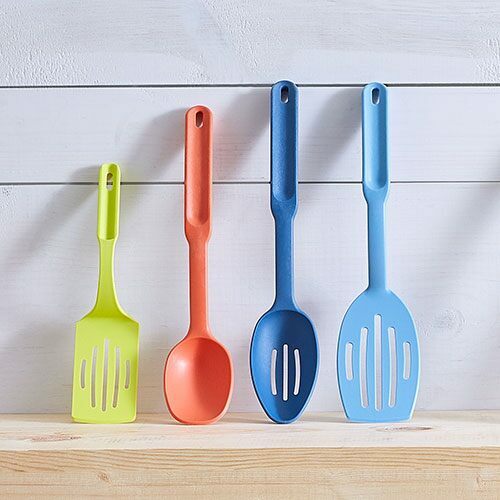 This versatile, and very colorful, set of kitchen tools is so much fun. It’s perfect for anyone who likes a little color in their kitchens. Of course, they’re dishwasher safe, and heat resistant up to 428 degrees. However, I don’t use mine on the stove (so I can’t attest to how they stand up to heat) I bought them specifically to use for serving. 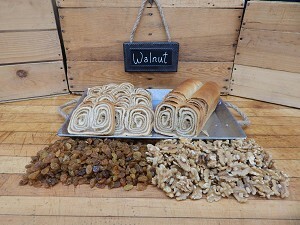 When asked if you want potica, the answer is always “yes.” Except if the question is about including raisins – then it’s a “no.” Yes to walnuts, no to raisins. Pretty simple! And aside from making it yourself – this is the best place to order it from. They ship it fast, and fresh – be sure to order the 2 pound loaf. Trust me, you’ll want to be sure to get a slice! This is a great company to work with (I may have had some trouble deciding on the right size, and they were quick to help me out), and their super comfy aprons are fantastic. They’re easy to throw on, wash, and run errands in. They’re also fabulous to cook and clean in – especially if you’re like me and have rough counter tops that wear holes into your clothes. Aprons are a must! I use knives all the time, and sometimes, I just don’t want to get out the expensive ones to do a small job – like slice a banana, or cut a sandwich in half. 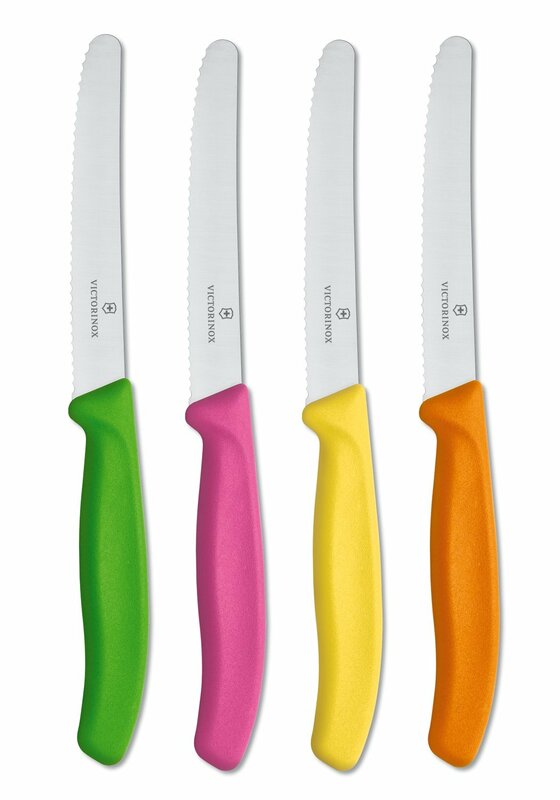 That’s what I use these babies for – they’re dishwasher safe, super sharp, and very convenient. If you find these locally for a reasonable price, grab a handful! I store mine in a small ceramic utensil jar on the counter (to prevent cuts trying to grab them amongst other utensils in a drawer). I’ve had them for years, and they’re still just as sharp as the day I bought them. This is a shop that we discovered in Apalachicola, FL on our travels to Saint George Island. We love their goat’s milk soap (the one pictured has a slice of sea sponge in it! ), and their sea sponges. 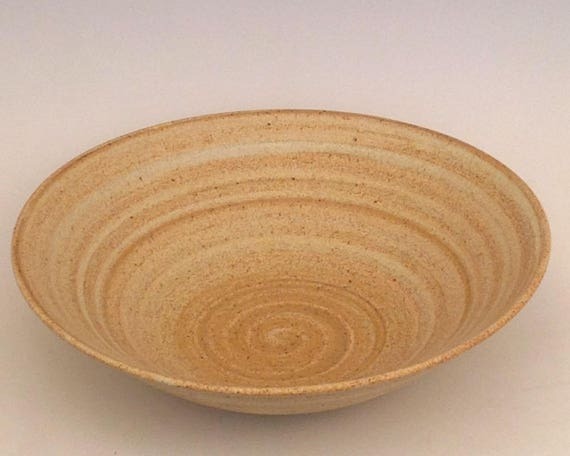 Love, love, love these handmade bowls from George Scatchard Pots on Etsy. I bought a huge one a few months ago, and it’s even more beautiful in person. The bowls are heavy (in a very good way! ), and fabulous! He does a fantastic job packaging these beauties so that there’s no breakage – which I really appreciate. Please look closely at measurements before purchasing so you know what size you’re ordering! This store has a lot of everything. But I mostly buy their fabulous notepads. I am a notepad/journal junkie, and I really dig quotes, so this is just about my favorite one! I bought this for myself this year as an early Christmas present. I’m not the only one that does that, am I?! I wasn’t even sure if I was going to crack it open and write in it, because it’s so darn pretty, with nice paper, and stickers! But I did it, and I love it. It’s not like a regular calendar, or planner. It’s a cross between a journal, a guided study, and a goal brainstorming workbook. The first 60+ pages are guided journaling to help you uncover your goals, and work your way through achieving them monthly. I wanted to get a head start on that, so that in January I could hit the road running (so to speak). It’s funny to me, that for years I give the same basic laundry list of general goals – walk more, lose weight, eat better, be more patient, get Christmas gifts wrapped early, etc. But I never get past just listing them – I’m realizing that’s because there was no plan of action. No wonder they haven’t exactly worked out. Sheesh! So this year, I’m hoping that with the help of this workbook, I’ll be able to work towards at least a few of my goals, or at the very least keep them at the forefront of my mind so I have a shot at holding myself accountable! Happy Shopping! Let me know what your favorite finds (and gifts to give) are this season! This has got to be the perfect dessert. It’s warm and gooey, fudgy and dense, creamy and tart – and it’s super fast to whip up. Promise me that when you make these, you’ll absolutely serve them with vanilla ice cream and (if you have them) fresh raspberries, and/or strawberries?! Or forget the berries, you need the ice cream! Definitely, a big scoop of ice cream. One other small detail – I used these ramekins to bake the hot chocolate cakes in. I actually bought them awhile ago, because why not (insert husband rolling eyes)?! While they’re no longer available at my local Walmart (it’s probably safe to say that they’re not available at yours either) – you’ll need to order them online. I highly recommend these particular ramekins, because (1) I used them for this recipe, (2) they’re heavy duty, and (3) dishwasher safe (yay!). However, if you have something else, you can still give the cakes a try, but remember you may have to make adjustments to the baking time. For the record, these ramekins are 7 ounces each. Preheat the oven to 350 degrees. Place 6 (7 ounce each) ramekins on a rimmed quarter baking sheet – set aside. In a medium (microwave safe) bowl, place the chocolate and butter, and microwave for about 1 1/2 to 2 minutes – just until almost melted. Stir the mixture until combined and completely melted. Set aside to cool slightly. In the bowl of a stand mixer, use the whisk attachment to beat the eggs and sugar on high speed for 4 minutes (set your timer!). The mixture will be light colored, and slightly full and creamy looking. Turn the machine to a lower-medium speed (about 4), and continue to beat the egg mixture while adding the salt and vanilla. Then carefully pour the warmed chocolate mixture in a steady stream into the egg mixture. Once all the chocolate mixture has been added, increase the speed of the mixer to about an 8 to make sure everything is combined. Then remove the bowl from the mixer, and add in the flour and cocoa powder. Whisk just until smooth. Spray each ramekin with nonstick spray, and then pour batter into each ramekin – leaving about a 1/2 an inch of space at the top. Bake the cakes in the oven for 20-22 minutes, rotating pan halfway through the baking time. If some of the cakes bake faster than others, you can take the ramekins out individually to unmold, and continue to bake the others. Just another bonus of baking them in individual ramekins! Serve them with ice cream and fresh berries! **If you are truly only making these for 2 people, that’s okay! Just make sure to unmold all of the cakes onto a parchment lined baking sheet and refrigerate the remaining cakes. These reheat nicely on defrost in the microwave (in about 30 seconds), and they’re still gooey and perfect! Not unlike most people, we have a birthday tradition in our house where the birthday person gets to pick the dinner (homemade or out to eat), an event (movie, fishing, laser tag, etc. ), and the cake (or birthday dessert). We usually just celebrate as a family, and have a really nice time together. So much so, that the kids haven’t asked for big blowout (school friend) parties since we started this new tradition 5 or 6 years ago! This year, for my son’s birthday he went rogue and requested a cake none of us had previously made, or even eaten somewhere else. And it was a smash hit! I bring you the amazing raspberry swirl cheesecake. The bottom crust is a soft vanilla sponge cake, topped with a creamy cheesecake layer, and then swirled with a tart raspberry filling. It’s amazing, and you’re going to love it! Special equipment/ingredients you’ll need: 10 springform pan, extra large sheet cake pan for a water bath (mine is 12 x 18 inches)/ or a large roasting pan, parchment sheets, a medium-sized sieve and extra large eggs. Line a 10-inch springform pan with parchment (cut to size, or use a parchment sheet). I have sheets of parchment, so I lay the sheet of parchment on top of the base of the springform pan and then clip the ring to the base, with the remaining parchment sticking out the sides – I use the extra parchment to grab onto to easily unmold the cake from the bottom after it’s chilled. Then wrap the outside of the pan with 1 large sheet of foil – it should cover the bottom, and sides of the pan. If you use multiple short pieces of foil, there’s a good chance that the water (from the water bath) will seep through those gaps into your cake. Yuck! Set the wrapped cake pan aside, and preheat the oven to 350 degrees. In a small bowl, whisk together the flour and baking powder. Set aside. In a small microwave safe bowl – melt the 2 Tablespoons of butter, and set aside. In the bowl of a stand mixer – beat the eggs on high for 3 minutes (set a timer!) – with the whisk attachment. Add in the salt – with the beaters still going. Then, with the mixer still running on high, add in the cream of tartar, and the 1/3 cup of sugar a little at a time, until all the sugar has been added. Beat another 5 minutes (set the timer!) on high speed. The egg mixture will become thick, and light yellow. With the mixer still running, add in the extracts. Turn off the mixer, and remove the bowl from the stand, and fold in the flour mixture, just until combined. Pour in the melted butter, and fold in – just until combined. Spray the springform pan (that was set aside above) with nonstick spray and pour the batter into the pan. Bake for about 10 minutes, or until the cake is puffy and a cake tester comes out clean, or with a small crumb attached. Set the cake aside to cool while you make the raspberry puree, and the cheesecake batter. Place the thawed raspberries in the pitcher of a high powered blender, and puree on high until blended into a liquid. Pour the puree through a sieve set over a bowl, and press to remove all the liquid. You’ll have about 3/4 cup liquid. Discard all of the pulp from the sieve. Add the cornstarch into the bowl of strained raspberry puree, and whisk well to get rid of any white (cornstarch) lumps. Set aside. You may have to whisk multiple times to remove any lumps, it’s also helpful to let the raspberries sit for a bit in between to soften the cornstarch. Set aside. *If your raspberries are still frozen, you can speed up thawing by warming them in the microwave in a glass bowl on defrost. Unfortunately, any hot liquid will prevent the cornstarch from blending smoothly. So be sure to let the raspberry puree cool before trying to whisk in the cornstarch. In the bowl of a stand mixer using a paddle attachment, beat 1/3 cup of sugar with 1 package of cream cheese, the cornstarch, and the salt on medium speed (about a 4). Beat for 3 minutes (set the timer!) – it’ll go from crumbly to creamy in minutes. Scrape down the sides of the bowl, and add in all of the remaining cream cheese, and 1 cup of sugar, and the vanilla. Beat until combined. Then add in the eggs on low speed, beating after each addition. Scrape the bowl. On low speed, beat in the heavy cream, just until combined. Don’t over mix! Scrape the bowl one last time to make sure everything is combined. Pour the cheesecake batter on top of the slightly cooled sponge cake. Then top the batter with dollops of raspberry puree. Using a knife swirl the raspberry puree into the vanilla batter using a circular motion – try not to over-swirl, because the cake will turn pink. Place the cheesecake in the center of the sheet cake pan, and place it on the middle rack of the oven. Pour hot tap water around the cake until it reaches about 1 inch up the side of the cheesecake pan. Close the oven, and bake the cheesecake for 1 hour. At this point, your cheesecake will have risen completely – straight across the top (no sunken middle) and jiggle like almost set J-ello when moved. Using oven mitts, carefully remove the cake from the water bath and place it on the counter to cool undisturbed for 2 hours – to prevent cracking. Leave your baking pan full of water in the oven until it has cooled completely before moving it to drain. You don’t want to burn yourself, or anyone else! After 2 hours, remove the foil from around the cheesecake and discard. Leave the cheesecake in the springform pan, and place a paper towel over the top of the cheesecake pan, and place the cheesecake in the refrigerator overnight. The next day, remove the cheesecake from the refrigerator, discard the paper towel, and while holding the bottom of the cheesecake pan flat against your palm, with your other hand, unlatch the springform clip. The ring should come loose and fall around your arm like a bracelet. Set the cheesecake down on the counter, and carefully lift one side up with the extra parchment, and remove the base. Then, while holding the cheesecake in your palm, carefully pull back 1/2 the parchment from the side you’re going to place on your serving dish, and place the side you just remove the parchment from down onto your serving platter, and simultaneously remove the rest of the parchment while setting the cake down onto the platter. Place the cheesecake (uncovered) in the refrigerator until you’re ready to serve. Once served, wrap the cheesecake platter up in plastic wrap. It’ll stay fresh and tasty for about 4-5 days in the refrigerator – if it lasts that long!